I think I’m being watched. I don’t know how many times we have passed to the N.S.E. or West of this place and never stopped. We finally decided this was the time. Often things you have always wanted to see are underwhelming when first finally experienced. This was my reaction to the columnar basalt plug that somehow became named Devils Tower (it was supposed to be Devil’s Tower, but a clerical error in the bill forever gave our first National Monument an incorrect spelling). After so much red rock in the southwest, the greenish gray of the tower was a bit of a disappointment. Set down in any other country in the world it would be the most visited place. shame on me! However, the surroundings, pines, grass and wildflowers were a welcome change, and we enjoyed two days in the campground. 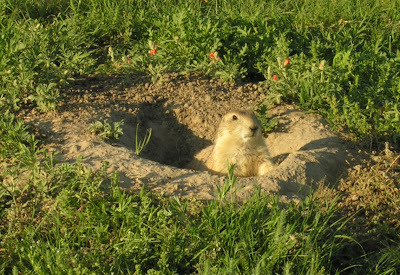 There was a prairie dog colony between the campground and the tower, and they were somewhat habituated to humans; nobody shoots them here, and it’is possible to get a good look. When they are hunted, as they are on most all private property in Wyoming, they won’t let humans within a couple of hundred yards of them. Our campsite was in the middle of a grove of cottonwoods, and the rustle of the leaves sounds like a gentle rain falling, even with the sun shining. Our sunroof gave us views of the small, heart shaped, leaves against a starry sky each night. Last night thunderstorms to the east added depth and interest to the stars and broken clouds. We got a sprinkle. Or was that just the cottonwoods?